Having a treadmill at home makes it possible to have a quick workout when you have a few moments to spare. Being able to workout regularly will result in a number of benefits to your health such as losing weight, improving cardiovascular fitness, boosting your metabolism and many more. However, the downside to having your own personal treadmill available when you want is that they can take up *a lot* of space, and aren’t always the easiest of things to move! One way of getting around this problem is to have a folding treadmill. This way you can reduce the footprint on the treadmill while it is not being used and usually unfold it in a matter of seconds when you want to do your workout. I have even seen some people position their treadmills in such a way that the front of the treadmill is in a wardrobe and then when its folded away you can shut the doors and the treadmill is out of sight. One point to watch out for when buying a foldable treadmill is that not all of them foldaway as well as you would expect. In fact, the ‘better’ the treadmill the more space it takes up when folded away. Let me explain – more expensive treadmills have a longer and wider the running surface, bigger LCD displays, and are made of thicker metal. All of this adds up to more space required for storage, even when folded. 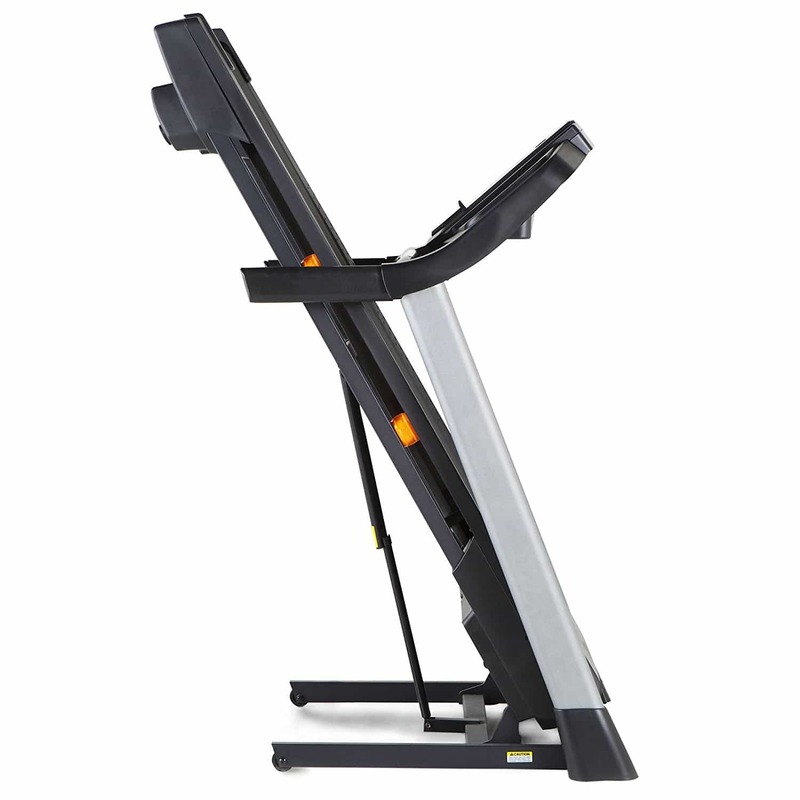 That said, some manufacturers are better than others in how they design the folding function on their treadmills. 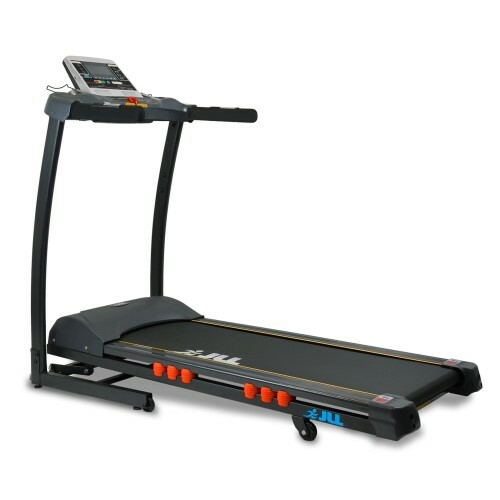 Ultimately the size versus quality is the main decision you will need to make when deciding on a folding treadmill. Like with commercial-grade treadmills you can still get all the features you would want such as power incline, large LCD console, heart rate sensors and varying sizes of the running deck. Obviously, it depends on how much you are willing to spend to the level of features you receive. With this in mind, I’ve reviewed the treadmills that I deem to have great value for money as well as taking up as little space as possible when folded away. The first thing I noticed about this treadmill when it arrived was all that I had to do was screw on the handles and LCD display which only takes a couple of minutes to do. Then simply plug it in and off you go. It still only has a maximum speed of 10km/h so I would recommend this product to anyone who is looking to lose a few extra pounds with beginner to intermediate workouts. This model has been designed so that it does go vertically when folded and the depth of it is just the handlebars and could be mistaken for an over-sized ironing board in the room. Weighing just 28KG, this model folds and is easy to transport thanks to the lower wheels. There is even a safety lock feature, so you can confidently store this model upright. The display is easy to read and settings are a breeze to adjust. There is a safety clip to ensure that if you fall, the belt shuts off. On the right and left of the display, you’ll find drink holders to hold your water. Another feature you’ll notice is that to the right and left of the display are two speakers. You can easily connect your iPhone or MP3 player to this treadmill and utilize the Hi-Fi speakers, so you can breeze through your workout while listening to your favourite hits. One thing that you’ll rarely find that X-Lite has offered is a free e-book for running, weight loss and more. This ensures that a novice or first-time runner knows exactly how to maximize their results. 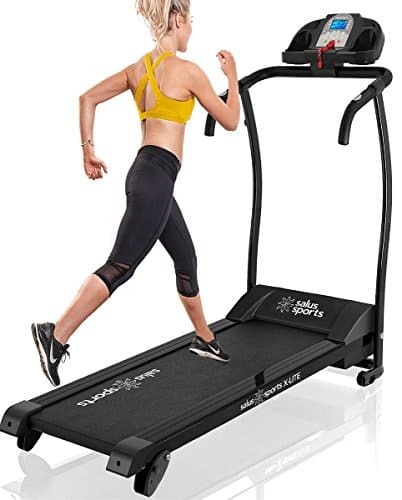 Sturdy and reliable, the 12km/h speeds are very hard to obtain, the 12-preprogrammed training options range from extremely fit to the first-time user, and the 3 incline levels are more than sufficient. When you’re done, this model folds up so small that it barely takes up any space. As you may be able to see from the picture this particular treadmill wouldn’t look too out of place in a commercial gym. It is built to a high-quality finish with a sturdy design and offers a smooth/ quiet run being powered by a strong motor that has a 5-year warranty just in case something did happen to go wrong with it. 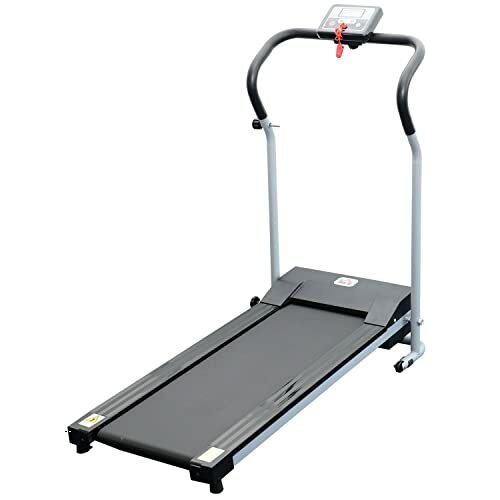 Compared to some of the cheaper folding treadmills it is nice to have an auto incline especially when it has 20 levels ranging up to 12% which makes it possible to find the perfect angle that suits you. 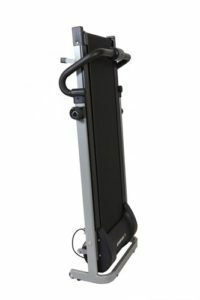 My only slight niggle with this model is that, although it is a folding treadmill its length is still 1000 mm once folded, however despite that I do still believe it is a fantastic folding treadmill as it is rare to find an almost commercial spec treadmill that is foldable.